The Canon PGI550 black ink cartridge is one of six new Canon cartridges used in the latest Canon Pixma printer range. The high capacity black ink cartridge is used in over a dozen Canon printers and is now available as a low cost compatible ink cartridge. This is great news considering the cost of the original brand cartridge that can be bought online for around €15 with the non-original version costing around €6 when bought as set of 5. The print quality of the compatible PGI550 black is fine for every day general-purpose printing but if you are looking for photo lab quality then you would be better to use the original brand cartridges. There will be a slight noticeable difference in the print quality if you were to directly compare the results of an image printed on an A4 glossy paper with a non-original compatible PGI550 black. But be honest, it is the same with any compatible ink cartridge, it all depends on what the end result is needed for. If it’s for school assignments, general office printing etc then the compatible ink cartridge gives perfectly acceptable results. The other colours associated with the PGI550 Black are the CLI551 ink cartridges and they come in black, cyan, yellow, magenta and grey (some printers will not use the grey cartridges – check before you buy a pack with the grey included). Again, tests show that the print quality of the compatible non-genuine cartridges are fine and will provide good results. 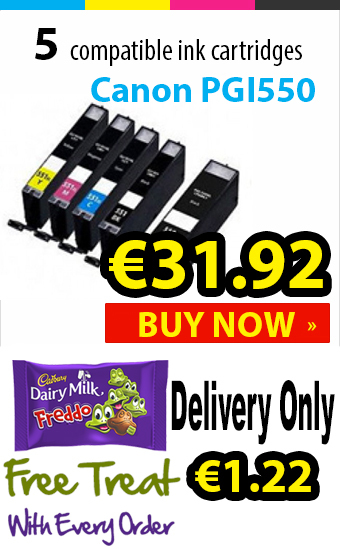 A typical set of compatible CLI551 ink cartridges online should cost no more than €35 and many online suppliers offer low cost next day delivery. The Canon printer may recognise the cartridges as non-original and may show an error message to this effect. If the message is more of a question than a statement, i.e. it will allow you to click OK then simply do so. If the message stipulates that the cartridges are non-genuine but doesn’t give an option to proceed by clicking OK, then simply hold down the stop button (usually a red triangle on Canon printers) for five seconds and then you can proceed. The vast difference in the price of the original brand PGI550 and the compatible non-original version is so great that it has to be worth a try. Once you get the ‘hang of it’ and in some cases the Canon printer may disable the ink volume levels when you use a non-genuine cartridge the savings are too great to ignore.